OCASI acts as a collective voice for immigrant serving agencies and coordinates responses to shared needs and concerns. OCASI has been at the centre of immigration in Ontario since 1978. Membership in OCASI gives organizations the opportunity to speak with a strong unified voice. 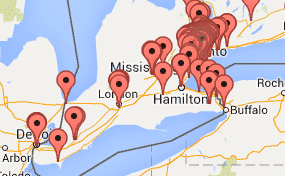 OCASI membership has grown to over 220 member agencies across Ontario. This growth reflects immigration and settlement patterns in Canada, with the majority of immigrants still settling in Ontario. Does your Ontario-based organization serve immigrants or refugees? Consider joining with OCASI to ensure that your voice is heard. Find out where are members are located on our interactive map.